A lump of uranium left to itself will gradually decay, one nucleus at a time. 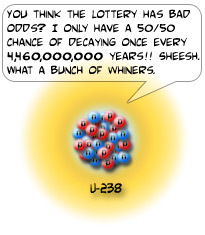 The rate of decay is measured by how long it would take for half of a given bunch of uranium atoms to decay (the half-life). The decay of an individual uranium nucleus is completely unpredictable, but we can accurately predict the way a large lump of uranium will decay.